Stephen Carter, assisted by Alan Russell, decided to put their summer holidays to good use this year. They filled up a giant sweet jar and set off on foot, going door-to-door in and around the Templepatrick area of County Antrim in Northern Ireland, asking people to guess how many sweets were in the jar. 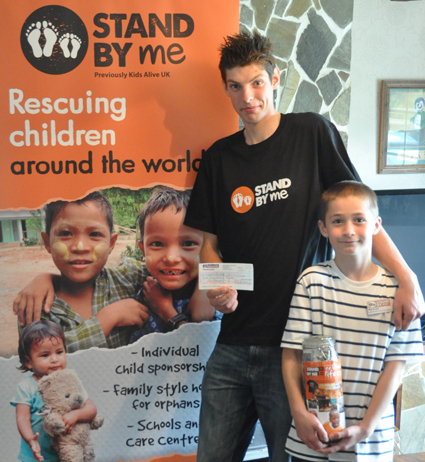 Having sought permission from Stand by Me and with official documentation, Stephen and Alan told folk that the money would be going to the work of Stand by Me and after many days, the boys had raised an incredible sum of £600. Having overcome many challenges in their own lives, Stephen and Alan’s story is a remarkable display of determination and compassion. Their foster carers, Michael and Francis Montgomery, also decided to build on the boys’ success and held a coffee morning which raised an additional £400, taking the total to an incredible £1,000. The money has been earmarked to help create a library for our school in Bekoiji. What an amazing achievement for two amazing guys.